Poets from around the world have been sending poems to the People’s Library in an effort to create a living/breathing poetry anthology in solidarity with the Occupy Wall St. movement. All poems are accepted into the anthology. The anthology is updated on a weekly basis. If you’d like a poem added to the anthology email stephenjboyer@gmail(dot)com and please include “occupy poetry” in the subject. The OWS Poetry Anthology is open to all languages! Every week more and more languages are added to the anthology as more and more poets from around the world are joining in to make this text more nuanced. I’m very sorry, I’m limited to English so please pass this on in other languages if you possess such magickal abilities. No poem will be translated as that creates a heirachy of language. However, if the poet who sends in a poems wishes to include the poem in more than one language, all the versions will be added. If you’re planning on printing the PDF to place a copy of it in your area, the first sketch page is the cover of the anthology. The wonderful artist Molly Crabapple did the sketch. I write in sharpie marker “OCCUPY WALL ST POETRY ANTHOLOGY” around the figures head and usually include a thought bubble that says, “I Love Poetry” somewhere in the margins… I’d recommend doing something similar and that you laminate it for safe keeping. Laminating a second page and placing it at the back of the anthology adds extra protection. And then three-hole punch the entire document and put rings in it for easy-reading! Let’s spread these anthologies everywhere! 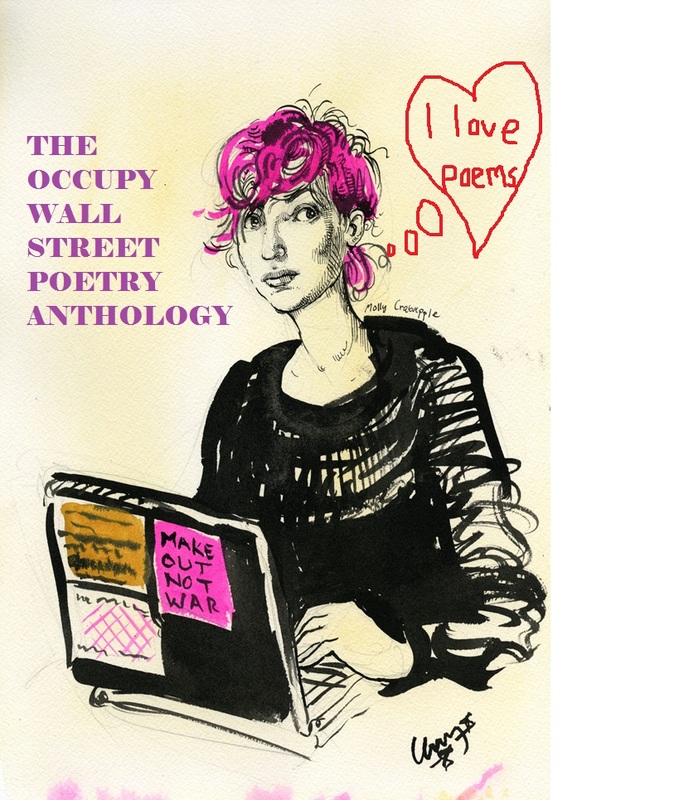 Here’s The Occupy Wall Street Poetry Anthology PDF file! The Suggestion Box file goes at the end of the anthology. Songsheet/Lyrics by Loudon Wainwright III given after his performance at the Peoples Library, should be placed as the final page of the anthology.